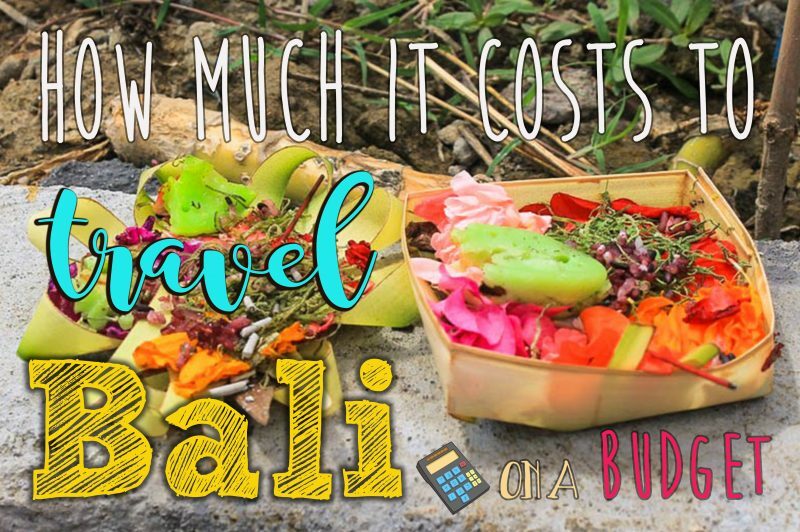 While in Bali, we kept track of all our spendings and in this article we will show exactly how much it cost us to travel Bali. Kuta is a place we like to avoid, at least when it comes to accommodation and eating out. Ubud is also a bit more expensive than the rest of the island and we have another, more in-depth guide to Ubud as well. All prices mentioned in Indonesian rupiah (€1 was worth approximately 15,133 IDR (exchange rate on 21/01/2016) during our trip). We spent 1,200,000 (€79.30) in accommodation. We stayed in Soca House in Ubud; we stayed with Couchsurfers for the rest of the stay. We took a taxi from the airport after our arrival for 80,000 (€5.29). For the rest of our stay, we rented a scooter to get around. As we had some trouble with our tire, we had to fix it several times. We spent a total of 3,626,390 (€239.63) in restaurants, shops and supermarkets for food and drinks. 1,476,200 (€97.55) of this was for snacks and food in restaurants/warungs. Eating in local places would have greatly reduced our spendings. Approximately 400,000 (€26.43) was spent in beer – due to very high tax, one bottle costs about 30,000 (€1.98) so we didn’t drink much. One exception was New Year’s Eve. Coffee and tea was a lot cheaper; we spent 83,200 on this. As tapwater is not drinkable, we had to spent a lot to keep hydrated. Quick stops for water, juices and slushies cost us 326,800 (€21.60). For using the ATMs, we spent about €3 in fees each time. Luckily for us, we no longer needed a visa for Indonesia. However, we were allowed to stay 30 days but stayed for 31 days so we were fined for overstaying. Because of the holiday season, plane tickets were very expensive and for us it was cheaper to pay the fine than to book an earlier flight. Also, when leaving Indonesia, a leaving fee always had to be paid but since last year (2015) this is no longer necessary. So, apart from the plane ticket and our fine for overstaying, we had no additional costs. Without paying for medical costs, scooter repairs and an airport fine, which we didn’t plan on paying for, a €7 per person per day is feasible.